Stenospermation spruceanum var. multiovulatum Engl. Botanische Jahrbücher für Systematik, Pflanzengeschichte und Pflanzengeographie 6: 281. 1885. Rhizome terete 2cm diam; petioles moderately strong, 20 - 25 cm long,at the base 1.5 cm thick, upwards somewhat narrowed, at last rounded; blades rigidly coriaceous, oblong or elliptical oblong , apex mucronate, narrowly small acute, more than 30 cm long and 10-14 cm broad; the primary lateral veins somewhat depressedand with an angle ca. 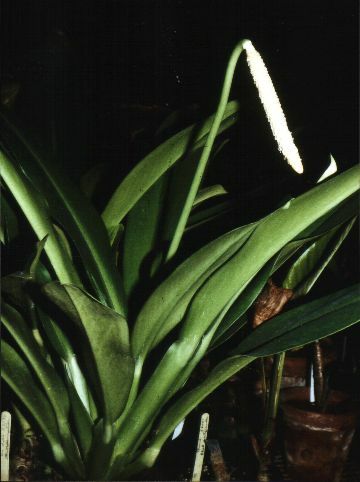 35°-40°; pedunclew erect, teret at the apex downwards curved, 30-45 cm long; spathe milky, somewhat elliptical at the apex abruptely acuminate 12-16cm long; spadix white, cylindrical, 8-18 cm long. Panama Bocas del Toro: 310 m, 8.45N 82.10W, 9 March 1985, T.B. Croat & M.H. Grayum 60129 (MO). Panama Cocle: 840-880 m, 08.38N 80.7.5W, 20 July 1990, M. H. Grayum & Randy Evans 9904 (MO). Panama Cocle: 775 m, 08.36N 80.07W, 25 March 1993, Thomas B. Croat 74786 (MO). Panama Cocle: 500 m, 8.42N 80.28W, 12 Jan. 1986, Gordon McPherson 7987 (MO). Panama Cocle: 200 m, 8.47N 80.28W, 17 Dec. 1983, H.W. Churchill, A. Lier, W.S. Armbruster & A. Herzig 4166 (MO). Panama Panama:, 21 February 1985, Henk van der Werff 7050 (MO). Panama Panama: 400 m.,, 12 Nov. 1963, Hutchison & Dressler 2973 (UC). Panama Panama: 400 m.,, 12 Nov. 1963, Hutchison & Dressler 2966 (UC). Panama Panama: 350 m, 9.15N 79.00W, 26 Jan. 1986, Gordon McPherson & M. Merello 8150 (MO). Panama Panama: 800 m,, , Kennedy 3376 (US). Panama Panama: 350-450 m, 9.19N 79.08W, 21 Feb 1986, Barry Hammel & G. McPherson 14510 (MO). Panama Panama: 370 m, 9.16N 78.57W, 11 February 1986, Scott Hoover 1310 (MO). Panama Panama: 300-350 m,, 27 March 1976, Thomas B. Croat 33686 (MO). Panama San Blas: 350 m, 9.20N 79.00W, 13 Feb. 1983, C. Hamilton & H. Stockwell 2904 (MO). Panama San Blas: 350 m, 9.19N 78.55W, 8 March 1986, Greg de Nevers & Heraclio Herrera 7250 (MO). Brazil Roraima: 04.3N 64.22W, 1969, Prance et al. 9626 (US). Colombia Antioquia: 2330 m, 5.52N 75.18W, 8 December 1986, James L. Zarucchi & Nohelia Bedoya 4514 (MO). 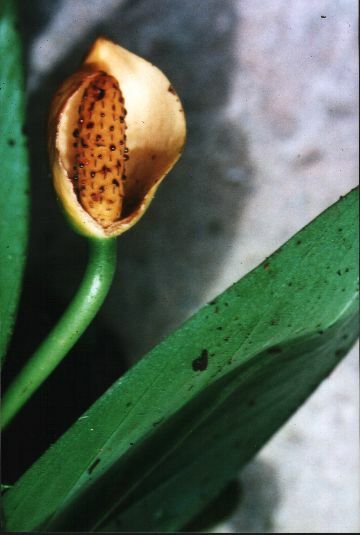 Colombia Choco: 240 m, 05.20.30N 76.13.45W, 23 Feb. 1990, Thomas B. Croat 70928 (MO). Colombia Valle del Cauca: Bajo Calima, 50 m, 4.02N 77.07W, 6 July 1986, Thomas B. Croat 61289 (MO). Colombia Valle del Cauca: 04.02N 77.05W, 12 July 1993, Thomas B. Croat & Dorothy Bay 75694 (MO). Colombia Valle del Cauca: Bajo Calima, 100 m,, 20 January 1988, Henk van der Werff & Miryam Monsalve 9651 (MO). Ecuador Imbabura: Lita, 600 m,, Oct 1980, Laura Cobb 30 (MO). Ecuador Morona-Santiago: Cordillera del Condor, 1850 m,, 5 Jan. 1972, MacBryde 971 (MO). Ecuador Sucumbios: 230 m, 00.00S 76.14W, 16 Nov 1991, Walter Palacios & Tipaz, Rubio, Gudi�o, Aulestia 9034 (MO!, QCNE). French Guiana : 03.37N 53.12W, 10 February 1993, Thomas B. Croat 74170 (MO). French Guiana : Saul,, , Determann , R. 27 (MO). French Guiana Cayenne:, 15 Mar. 1974, Granville 2127 (P). French Guiana Cayenne: Riviere Camopi,, 12 Feb. 1968, Oldeman & Sastre 186 (P). French Guiana Saint-Laurent-du-Maroni: Sa�l, 3.37N 53.12W, 8 Sept. 1989, Mori et al. 20854 (NY). French Guiana Saint-Laurent-du-Maroni: Montagnes Bellevue de l'Inini, 550 m,, 14 Aug. 1985, Granville et al. 7465 (P, U). Guyana : Cuyuni-Mazaruni Region, 70-120 m, 06.47N 59.45W, 19 Oct 1989, Gillespie & Tiwari 2396 (US). Guyana : Saul, 200-400 m, 3.37N 53.12W, 8 Oct. 1982, Mori , S. et al. 15072 (MO). Peru Huanuco: 672-800 m,, 5 abril, 2,4 mayo 1978, Jos� Schunke-V. 10131 (MO). Peru Huanuco: 800-900 m,, 17-18 junio 1976, Jos� Schunke-V. 9318 (CM, MO). Peru Loreto: 150 m, 73.30W 03.50S, 24 Feb 1981, Al Gentry et al. 31698 (MO).